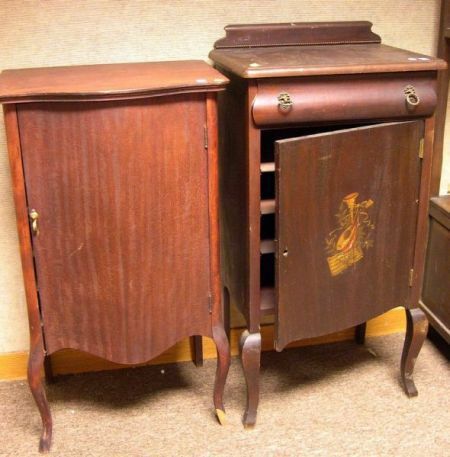 Two French-style Mahogany Veneer Sheet Music Cabinets. Assorted Vintage Estate and Costume Jewelry, two bags. Double Strand of Baroque Pearls. Contemporary 14kt Gold and Diamond Ring. Cabochon Jade and Diamond Ring. Pair of Contemporary 14kt and 18kt Cuff Links and 14kt Gold St. Christopher Key Cove. 14kt White Gold and Diamond Marquise Band. Tigers Claw Earring, Pendant and Brooch Set.